Are you ready to create an outdoor oasis where you can relax with your family in your own backyard sanctuary. Well you’ve come to the right place. Designing your pool online can be a complicated process on other websites, which is why we provide you with a bare bones tool to help you get a rough estimate and get the pool buying process started quickly. Contacting one of our expert pool builders will help you find out what an inground pool costs and all of the options that are available to you. 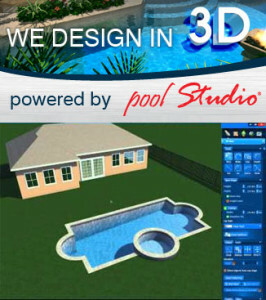 We can have one of our representatives present you with a 3D pool design plan for your custom swimming pool installation that you will be absolutely delighted with. Hi Good day. I am from the caribbean and I am considering building a pool in my backyard. Do you all offer services to prepare full drawings and specifications that can be passed to a builder to build the pool? Pool Building in Spring - Find Out How You Can Be Swimming Come Spring Time!